A dancer performs at a "Happiness for Thais" party in Lumpini Park Sunday. Since the coup the junta has been on a tear to restore happiness to the Thai people. It sounds silly, but the country has been riven by the recent political impasse. The situation had come close to open civil war between Red Shirts and Yellow Shirts (and the organizations the Yellows have morphed into). Shootings and grenade attacks were commonplace and both sides used vitriol against the other. There was a real need for a nationwide time-out and General Prayuth, while suspending free speech and rounding up opponents of the coup, has also tried to provide the time-out. The junta has organized a series of events straight out of the "Winning Hearts and Minds" (WHAM) manual. Free food, entertainment, health checks, haircuts all provided by the army or army approved organizations. Sunday there was a "restore happiness" party in Lumpini Park, the site of large protests against the elected government before the coup. 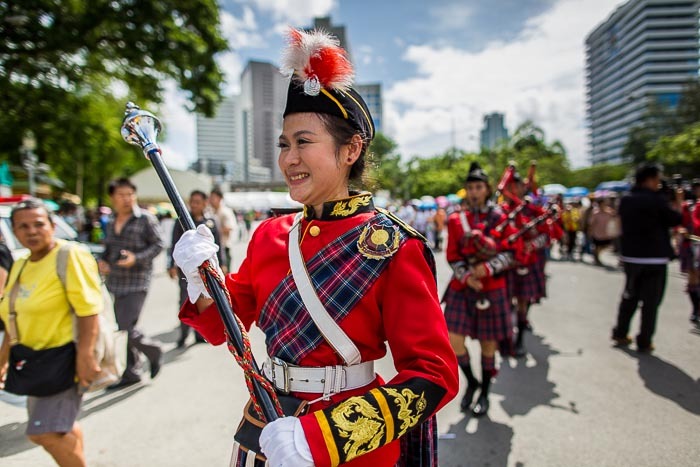 A Thai bagpipe band, complete with kilts, marches through Lumpini Park. A couple of thousand people showed up for the afternoon's entertainment. 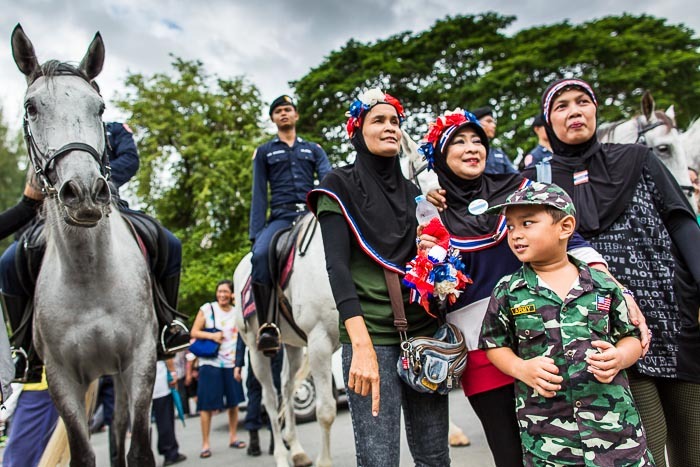 They partook of the food and scored free tee shirts, posed for "selfies" with soldiers (which has turned into a very popular past time in Thailand post coup) and generally had a good time. "Selfies" with the Royal Thai Police mounted unit. There are more photos of the Happiness party in my archive or available from ZUMA Press.